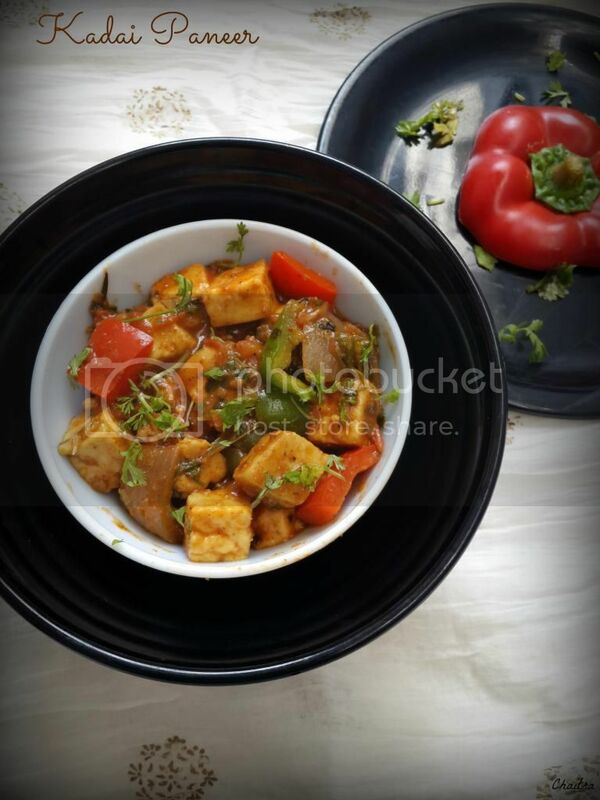 Ever since I tried this Kadai Paneer recipe it became a family favorite. Not sure what's the X factor that demarcates this dish from others, but I have been having frequent requests from Mr.P to pack this in his lunch dabba along with some mild pulao and he is so happy that he doesn't want to share his dabba with anyone. I love the simplicity of this recipe as it does not involve any grinding or roasting works. It just involves simmering and blending of subtle flavors. I am blogging from my mom's place and I am not having all the pictures of Kadai Paneer with me. Will be adding more pics shortly. So lets hit the road. 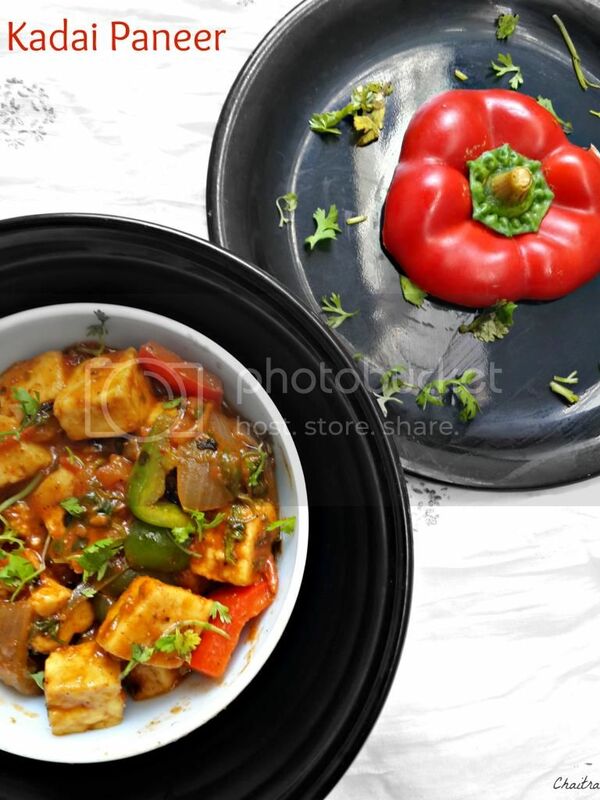 If using frozen paneer, keep it immersed in hot water until use. Take a heavy bottomed pan and heat oil in it. Add cumin seeds, ginger pieces and green chillies. Fry for about a min. Add onions and fry until translucent. Its time add Tomatoes, so go ahead with finely chopped tomatoes. Lower your flame and cook till tomatoes turn to a mush. Add your masalas and ensure that they are blended well into your gravy. Crush Kasoori Methi with your palms and add it to your gravy. Also add your tomato sauce. Time to add Capsicum pieces. Just mix them and do not cook them till tender. They should be crunchy. Remove paneer from hot water and gently squeeze them between your palms to remove excess water. Add them to your saucy gravy. Mix all the ingredients well and add water to this gravy. Cook till you get a semi dry consistency. Garnish with coriander and serve. 1) I would suggest adding capsicum after paneer is added. So that they do not lose their crunchiness. 2) Tomato sauce is optional. 3) You can use tomato puree instead of chopped tomatoes. 4) Make sure your gravy isn't too tangy. I used hybrid tomatoes to cut on the tanginess. 5) If you don't like ginger, you can use ginger garlic paste as an alternative. Just fry till your raw smell subsides. This post comes right after an exciting win at Nirlep. So yours truly made all the way to winning first prize and here I stand(type) quite elated in front of you. So last week Nature's Valley Granola bars caught my attention and I ended up picking one big pack . Though I found the price little on the higher side, I thought after a tiring day I could nibble one and get some instant energy. Without even waiting for the week to pass, I completed all those 6 bars big bars. So much so that I was waiting to get my next pack. That supermarket is quite far from my place and so was the price of granola bars. I google searched for some easy energy bars... but to my luck I could find some chewy bars and they are least to my liking. 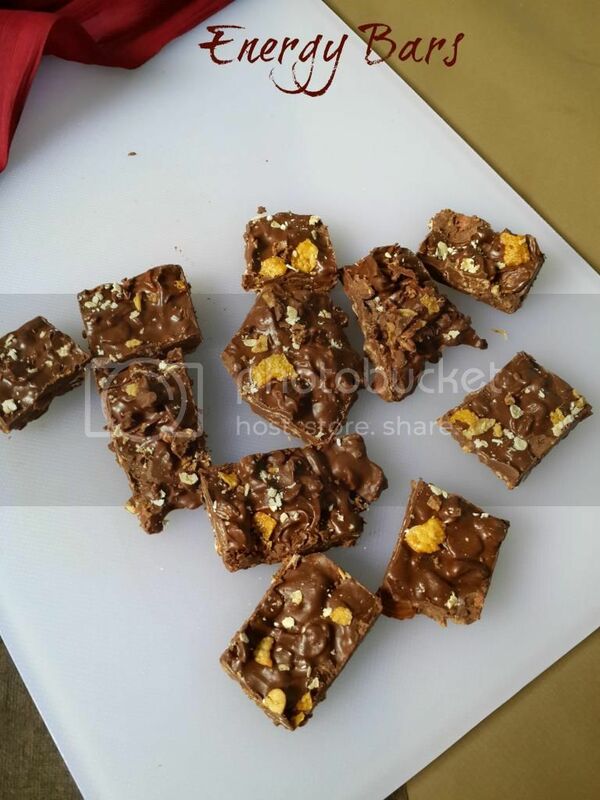 So taking experience from my chocolate making classes, I prepared these crunchy bars using simple ingredients...Just the way I wanted.. These quickies are easy peasy and so far the best I have tasted. They are healthy, tasty and crunchy. So let's hit the road. 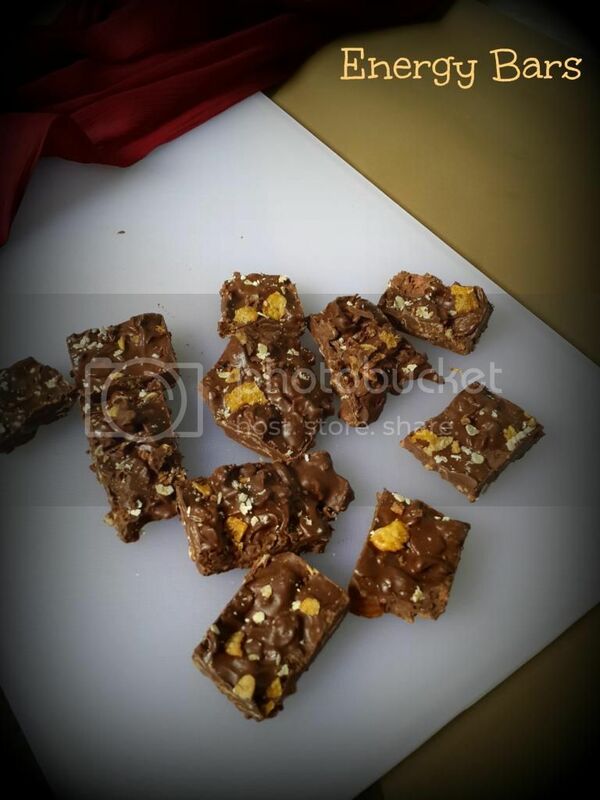 Melt dark chocolate using double boiler method or alternatively microwave for 20-30 secs. To this melted chocolate, add 1 tbsp of butter and remaining ingredients. Combine all the ingredient and this mixture is rigid to handle. Apply butter on a plate and pour this mixture in it. Using back of a spoon, level this mixture evenly. Refrigerate this mixture for 15-20 mins. Once it is set, use a sharp knife and cut them into pieces. Store in an air tight jar. These bars stay good in room temperature for 2 days but best for about a week in fridge. You can replace butter with softened peanut butter and add honey to melted chocolate for extra taste. I used Saffola Nuts Muesli which is loaded with nuts. If you are using sugar free muesli or one which is devoid of nuts, then you can add nuts of your choice. You can also add flax seeds, sesame seeds and roasted oats. I still remember the day I shifted to this rented house instead leaving hostel (read it as terrible) life behind. Without any plans as to how I will be surviving or what are the minimum things that I will need to get on, I just took a decision in jiffy only to repent post shifting. The major challenge was what to buy... because everything in the supermarket appeared to be useful or pretended to be of use soon. So to eliminate my everyday chase and multiple lists and consolidations, I went room by room to buy quite essentials. Tik....Tik...Tik... There enters the dragon....The Kitchen. When I started rechecking the items I bought, I realized that I had to get some off from my shopping bag or I had to compromise on quality of the kitchenware if I had to accommodate all. I was not really convinced on compromising with quality or the choice of kitchenware. Somehow huffing puffing and quite embarrassed I left the shop because I had to Compromise somewhere on the quality or I was unsure if it was the disappointment that I couldn't get something off my choice. That was 3 years back story.... Now I am happy camper here... I make most when there is a sale going on. Let me rephrase my sentence... It is my loot.. Guess what Just in the month of August I got some super cute and branded cookware for my kitchen at cool prices and also got some cashback for my shopping. Personally after that experience.... I have decided that I wouldn't compromise on quality or would I take any not so nice unbranded stuff. So the best way to hit the nail right on without weighing my wallet is to make the most during the sale. Its been real long since last posting and I owe it to my work pressure. With built in work pressure my blogging took back seat. When I was on a quick breather and was randomly checking fb posts, what caught my attention is that my blog is gonna reach 2000 likes soon. I felt so happy viewing those insights of my page and the never ending love I am receiving from you folks. Thank you readers!! I am truly humbled at this point and want to share a virtual sweet treat with you all. Bring milk to boil. Once it starts boiling change your flame mode to minimum or Sim. Add cooked rice to this mixture and allow it to cook for 2-3 mins. Now add jaggery to it. Keep stirring continuously and make sure that rice-milk-jaggery are combined well. Meanwhile heat ghee in a kadhai and fry all the nuts until golden brown. Once done keep them aside and allow them to cool. 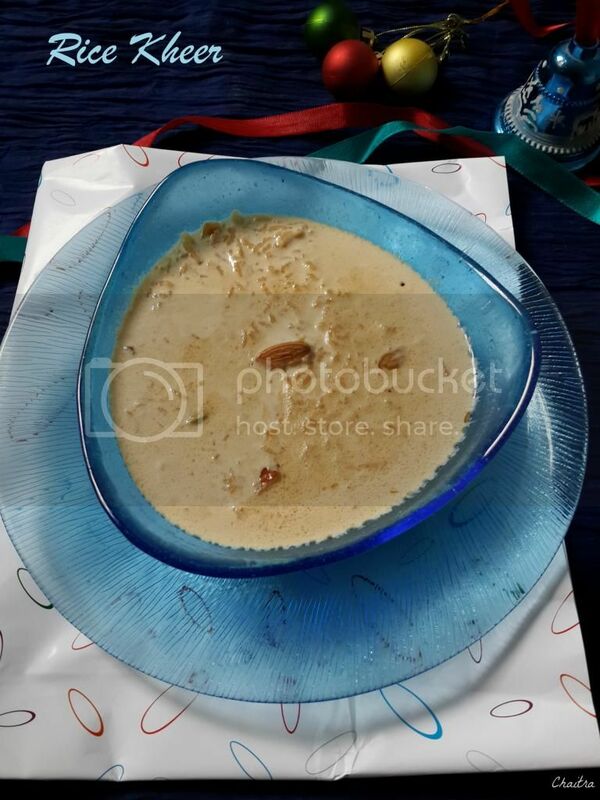 Once your kheer attains desired consistency, add nuts, salt and cardamom powder. Give a final stir and switch off the flame. Serve hot or cold. 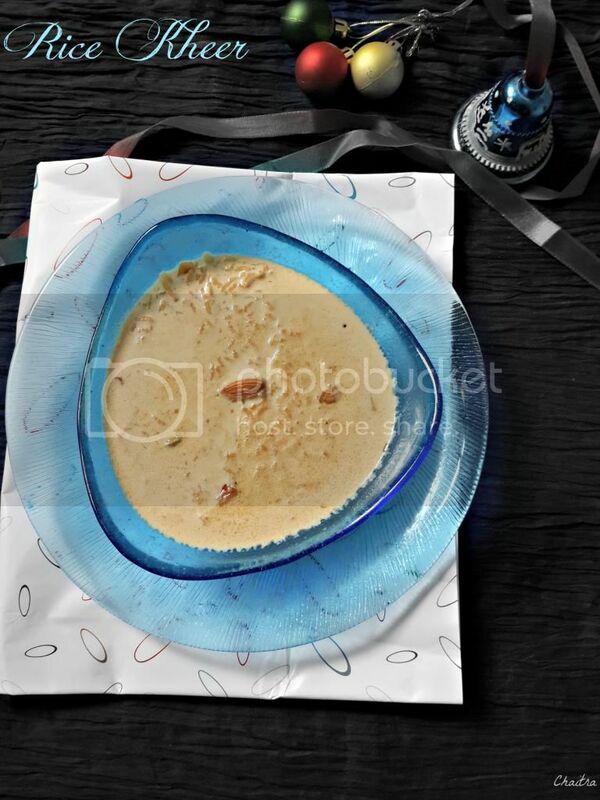 While serving you can drizzle honey or chocolate sauce to give that X factor to your kheer. You can make syrup of jaggery with 2 cups of water and pressure cook rice along with this syrup until 2-3 whistles. Once this mixture is cooled, add milk and mix well. 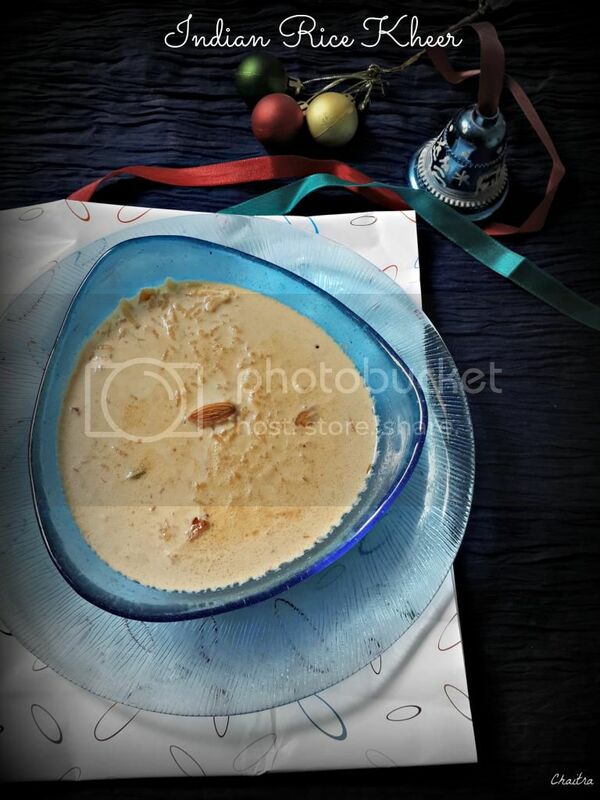 Add nuts, cardamom powder and salt to this kheer and serve. Instead of using cooked rice, you can add uncooked rice to boiling milk and cook. This consumes lot of time but tastes good. Adding salt enhances flavor of your kheer. 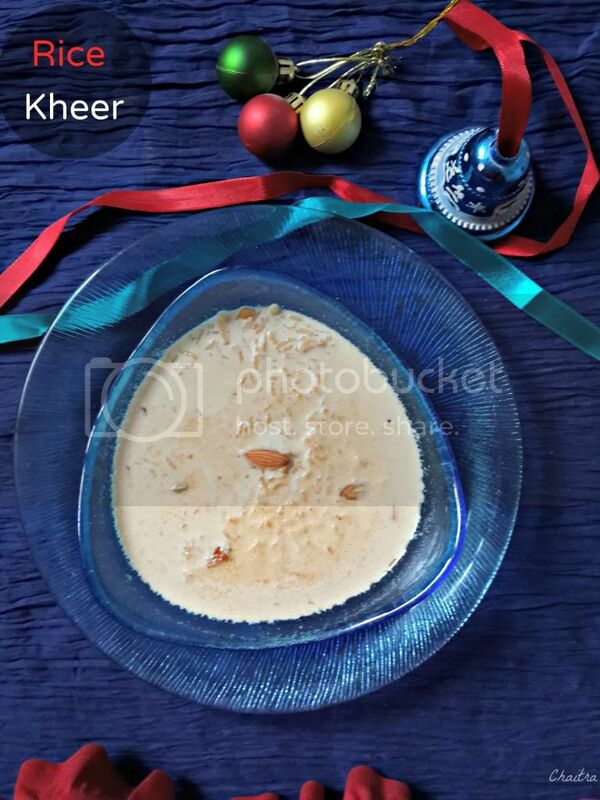 If you add roasted nuts directly to your kheer right after roasting them, milk might get curdled. Leave your kheer little runny. As it cools it becomes thick. All rights reserved - Do not copy or reproduce images without permission - Aathidhyam by Sindhura. Powered by Blogger.